Three Years. Five Continents. One Motorcycle. 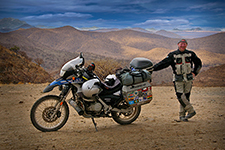 Those of you who know me remember, and for those of you I’ve yet to meet, I spent three years traveling around the world alone on my 2005 F650GS Dakar. While I’ve delivered a few presentations at Bob’s BMW, there are lot of stories, adventures and lessons that never made it into those presentations. Allan Karl author of Three Years. Five Continents. One Motorcycle. I share many of these stories and lessons—plus hundreds of more photos and delicious recipes from each of the 35 countries I traveled in my new book FORKS—A Quest for Culture, Cuisine, and Connection. It’s a big book—coffee-table size and packed with info—including my packing list, maintenance and parts used over three years. What many people don’t remember — and what I will never forget—is how instrumental Bob’s BMW was in getting me some of those parts which are difficult to find in the vast plains of Patagonia or the wild savannah of the Serengeti in Tanzania. Where other part vendors refused or were unable to ship parts to the remote ends of the earth, Bob’s always came through. One particular challenge came when my battery would no longer hold a charge. I was in the Andes Mountains in Bolivia. After making phone calls, taking taxis and busses to nearly every battery and motorcycle parts supplier in Bolivia, I called on Bob’s BMW. Unlike a clutch cable, fork seals or steering head bearings (all parts I needed during my trip) batteries are considered hazardous materials. Bob’s didn’t hesitate and quickly processed the special paperwork and customs documentation required. That battery made it to Bolivia and I was able to get on with my journey. When I finally returned to the United States, I retrieved my bike from the Port of Baltimore. For the first time in three years, my trusty Dakar was back on U.S. soil. Yet before I made my journey across these United States to my home in California, I again relied on Bob’s to do a complete maintenance and check—preparing me once again for the long journey—where I rode only backroads, never a freeway, highway, interstate or turnpike. As I did all over the world, I wanted to take a slower and closer look at my own country. If you haven’t picked up a copy of FORKS, you can order a copy on my website (I’ll sign it) or you can save a few bucks and order from Amazon. No matter where you buy your copy, be sure to give me a shout out and let me know what you think. Hope to see you on the road, or at Bob’s BMW, soon!